An assault rifle is only reliable as its magazine. And a high performance AR-15 is worthless without a solid and high quality magazine. As with many other parts of the AR-15 there are dozens of options from which to choose. To make your choice a little easier we’ve narrowed the list down to some of the top performing brands. So what are the best magazines for the AR-15? Brownell’s very own magazine is able to accommodate the .223 Remington as well as 5.56mm NATO AR-15 cartridges. For your information, these cartridges are very popular and well-known to be paired with the AR-15 rifle to the point that you can even interchange them, according to your preference. However, it is best to refer to the instruction manual before doing so. In terms of capacity, this product holds up to 30 rounds altogether, 30 rounds is a rather common number/capacity and if you notice, most mags offer 30 rounds. However, if you’re going competition shooting or so, I suggest you get a mag with higher rounds for convenient shooting. Equipped with a rugged military gray finish, this model is made from aluminum. Though most people prefer polymer mags, the aluminum ones are good to go as well. However, you can give it a little drop test before proceeding to shoot with it. The test is rather simple, whereby you need to drop the magazine to the ground, from a certain height. If it leads to severe feed lip deformation, then it’s a bad sign indicating that it will not be able to handle the powerful recoil from your weapon. Furthermore, all components are manufactured under strict ISO quality control standards and are made of mil-spec materials. In terms of construction, it is said to be rather solid and sturdy because the magazine is heat treated and comes with a welded aluminum body. On top of that, the body is hard anodized to provide excellent corrosion resistance, then applied with a tough-dry lube coating which comes in handy to eliminate any need for additional lubricant, which would sooner or later attract sand, dirt and dust. Apart from that, this updated material and design of this product that holds the 30 round mag have also been adapted and incorporated to Brownell’s very own straight bodied 20-round model. The follower on the other hand is made from the latest military-type glass-fiber reinforced composite material which further guarantees excellent and flawless feeding, even under the harshest tactical conditions. Just so you know, having a solid follower is essential so that they properly load the ammo into the breach of the barrel. The high-lubricity, dry-lube coated silicon spring is also corrosion resistant, in fact it is certified to a total of 500 hour salt spray standards as well as is less prone to spring ‘set’, therefore providing good pressure to the ammo, so they rise with a fair amount of force to hit the feed lip. Similar to the Brownell product above, the Lancer System magazine also accommodates the .223 Remington and 5.56mm NATO, AR-15 ammunition. It also holds 30 rounds (capacity) altogether and is made from solid polymer construction. The polymer material is said to be extra durable compared to using a metal mag, based on the drop test results conducted. Apart from that, it comes with a total of 5 magazines, nevertheless it is also available as a single product. 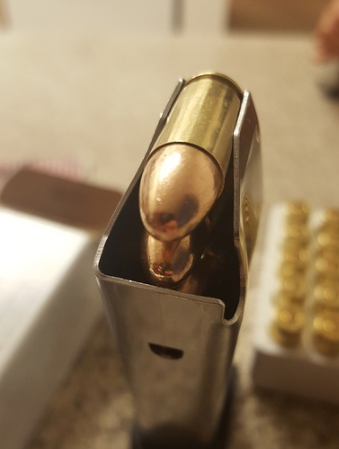 If you’re a frequent shooter or buying in a group, it is advisable to get them in bulks because it would be a great investment in the long run. Buying in bulks also contributes to cheaper price as it is slightly cheaper than original price itself. The unique part is that it is equipped with a clear and translucent finish so you are able to view your ammunition inside the mag. In addition to that, this lightweight molded polymer mag stands up to extreme conditions and rough handling in a tactical operation, including heat as well as impact of sustained full-auto fire. In fact, it is tested to withstand extreme temperatures ranging from -50 F to 180 F. Also, it is said to withstand a 5 foot drop onto concrete (with fully loaded cartridges) miraculously without any impairment or malfunctions. Not only that, the non-reflective exterior is equipped with molded-in ridges together with an improved texturing design which comes in handy to increase the structural strength and ensure a solid grasping surface. On top of that, the hard polymer base plate contributes to a positive gripping surface so you are able to extract the mag from tight-fitting pouches and remove them with ease, for cleaning and disassembly. Lancer System’s magazine features the AWM (Advanced Warfighter Magazines) which fills in the gap between the current metal and polymer mag designs, for a more reliable product. This 30 round model is able to accommodate pouches for the standard USGI-spec mags. Fixing it to the lower receiver of your AR-15 is rather simple, you just have to load it to the full capacity and insert it into the weapon with the bolt closed. Moreover, the feed lips come with a permanently attached and wrap-around feature. That being said, the feed lips are made from one piece of precision formed, hardened steel that is PTFE coated to enhance its resistance to corrosion. Other than for improving corrosion resistance, this PTFE coated feed lips promotes smooth ammunition movement without any hint of deformation, when the fully loaded magazine is stored for a long time. Also, constant-radius body curve feature as well as anti-tilt follower feature comes in handy to ensure smooth and snag-free feeding, without jamming. For your information, the Magpul brand is rather popular under the AR-15 magazine department. That being said, the Magpul PMAG Gen 3 polymer mag continues to revolutionize their magazine technology to accommodate the AR-15 and M4 platforms. In fact, the third generation PMAG is said to further expand the strength, versatility and reliability of the previous PMAG model. In terms of construction, it is molded from a strong and durable polymer formula, together with extra reinforcement in the feed lip and mag catch areas, that not only provides better corrosion resistance but also is strong enough to withstand all forms of impact, in the toughest tactical situations. You can do a simple drop test, to test the mag’s strength. If you drop it and the feed lips still remain intact with minimum deformation, then the magazine is good to go. Furthermore, it holds the .223 Remington as well as 5.56mm NATO ammunition. Equipped with a shiny black finish, it has a capacity of 30 rounds altogether. In other words, you can load the magazine up to a maximum of 30 rounds before inserting it into the lower receiver and taking a shot. Just so you know, 30 rounds is rather a common capacity in most mags. This AR-15 product is fully compatible with these products which are the HK 416, M27 IAR, British SA-80, MR556A1, FN SCAR MK 16/16S. In addition to that, it has a pen dot matrix on each side feature which comes in handy to provide consistent ID marking that resists handling wear. In other words, you can create a letter or number at the bottom of your mag based on the printed sheet provided for a distinct ID marking. Besides that, the pop-up dust cover assists in minimizing the debris intrusion in the mag, therefore contributing to its durability in the long run. The disassembly on the other hand does not require any tools so you can conveniently remove it with your hands, with maximum ease. Thus, this tool-less disassembly leads to easy cleaning. Also, don’t forget to get yourself an AR-15 cleaning kit! The spring is constructed from the solid long life USGI-spec stainless steel which is important to provide enough pressure to the cartridge to rise up, in order to hit the feed lip. Meanwhile, the removable floorplate is both stronger and slimmer in design. Last but not least, this product is equipped with a 4 way anti-tilt follower as well as a constant-curve internal geometry which further contributes to reliable feeding, with minimum chances of the mag getting jammed. This magazine model is almost similar to the previous one, with the only difference being that this PMAG Gen 3 model is available with a clear polymer window on each side. Why is this feature useful? To answer your query, it comes in handy so you are able to view the load status at a glance, with added convenience. These windows are constructed from an all-new formula of advanced, clear polymer that offers improved resistance to chemicals and powerful impacts, compared to that of the original Maglevel PMAG products. Moving forward from the Gen 2 PMAG, this polymer magazine continues to revolutionize the mag technology to fit the AR-15 and M4 platforms. In fact, the third generation PMAG is stronger and more versatile compared to the previous models. With extra reinforcement in the mag catch and feed lip areas, this polymer mag has excellent resistance to corrosion and is able to withstand all forms of impact from your firearm, hence contributing to its durability in the long run. Moving on, the spring is made from long life USGI-spec stainless steel which further contributes to its rust-resistant characteristics. My favourite part about this PMAG Gen 3 model is the pen dot matrix feature which allows you to mark different ID on your magazine with the pen provided. The pen dot matrix idea is rather innovative because it resists handling wear, in the long run. In addition to that, its pop-off dust cover reduces the intrusion of dust and debris into the mag hence making it easy to clean. Speaking about cleaning, you need not have any tools to disassemble the magazine in order to clean it. In fact, you can do so by simply using your hands therefore contributing to your added convenience. The floorplate comes with a strong and slim design therefore making it easy to be removed at all times. Moreover, this PMAG Gen 3 mag includes a 4 way anti-tilt follower together with a constant-curve internal geometry which results in reliable and smooth feeding. Just so you know, getting an anti-tilt and solid follower is vital because it functions to hold the cartridges in place, in order for them to load into the barrel properly. On top of that, it is compatible with these rifles including the HK 416, M27 IAR, British SA-80, MR556A1, FN SCAR MK 16/16S. The PMAG D-60 model is a lightweight, durable and highly reliable product. It holds a total of 60 rounds altogether which comes in handy if you’re a competition or avid shooter. This is because rather than the conventional 30 rounds, you’ll be having an extra 30 rounds to shoot at, without having to replace or reload them. In other words, with larger capacity (double) than the previous PMAGs, the PMAG D-60 allows the shooter with 60 rounds of ammunition. Hence, it effectively allows the same round count as 2 standard 30-round mags without requiring critical reload. Since it accommodates 60 rounds altogether, you can imagine a bigger and distinct shape of the magazine. Compared to the other models, this product features a unique drum configuration to compensate for the extra 30 rounds. Rather than making it bigger in terms of height, Magpul decided to give it a drum-like base to make sure the height is manageable as well as to allow prone firing and easier storage, thus improving your shooting experience. Speaking about the rounds, it holds the .223 Remington and 5.56mm NATO AR-15 cartridges. In fact, this polymer mag is able to fit any AR-15 or M4 compatible weapons. To be more specific, it is very compatible with a wide variety of NATO firearms such as the M16, M4, HK416, M27 IAR, MR556 and SCAR MK 16/16S. Besides that, the D-60 magazine is equipped with a paint pen dot matrix feature to allow for easy marking and a MagLevel system which contributes to instant capacity indication. That being said, the paint pen dot matrix allows you to mark in the holes at the bottom of the magazine. You can either make number or alphabets marking using the pen, in fact it resists handling wear and is not likely to fade away after a long time. Equipped with a black finish, the D-60 model is constructed from polymer, therefore making it solid and sturdy. However, you can do a small drop test to test its sturdiness whereby you just have to drop it on the ground and check whether it remains intact with close to no deformation, especially in the feed lips and follower. The Magpul Gen M2 magazine has an exceptionally rugged, combat as well as competition-ready characteristics, whereby it functions to work flawlessly at all times, even if left fully loaded for extended periods. In addition to that, it has a total of 30 rounds altogether, which is a rather common capacity in most Magpul AR-15 magazines. It comes with 10 quantities of magazine altogether. However, you can also choose between a single piece, 10 or 100 pieces, according to your personal preference that comes with varying prices of course. I like buying in bulks because it is worth my investment in the long run. That being said, it not only cost cheaper, but also saves me a trip to the store each time, just to get a new mag. If you’re an avid or competition shooter, you just totally get the ones in bulks because you’ll really be needing it. Also, if you plan on buying together with a large group of people or your friends, the magazine in bulks would really come in handy. For your information, this model holds the similar ammunition as the previous products; .223 and 5.56 NATO. Moreover, this corrosion-proof and self-lubricating single piece polymer body comes with an impressive black finish. To be specific, it is made from fiber-reinforced, molded polymer that has close to no spot welds or joints which will impair the follower. In fact, its constant internal curve results in a smooth and unobstructed movement of round stack. This curved body 30-round model on the other hand features the MagLevel configuration which includes windows on both sides, paired with an innovative orange indicator which functions to display the ammunition level. Meanwhile, the anti-tilt follower provides good stability to the stack which in return prevents nose-diving and bolt overhead failures from occurring. Apart from that, I personally like the easy to grasp ledge feature on the floorplates which comes in handy to extract the magazine from pouches, not to mention, these floorplates can also be removed with ease, for cleaning. On top of that, the exterior ribbing contributes to an added gripping surface in which the magazine catch notch replaces the traditional hole, to keep the dust and debris out. Last but not least, the spring, heat treated and constructed from stainless steel, is stress-relieved, in order to ensure optimal performance. Hence, it is able to withstand heat from prolonged full-auto fire and is not harmed by most solvents and bore cleaner, hence contributing to its durability. Equipped with a holding capacity of 40 rounds, this Magpul GEN M3 model is made from a solid molded polymer formula which provides excellent resistance to corrosion, therefore making it durable in the long run. It has extra reinforcements in the feed lip and mag catch which comes in handy so it can withstand crushing and all forms of impacts. The pen dot matrix feature on each side of the mag is rather interesting because you get to make a consistent ID marking which will last for a lifetime, due to its excellent wear handling resistance. The solid USGI-spec stainless steel spring, constant-curve internal geometry and 4-way anti tilt follower contributes to the excellent feeding system of the mag. In addition to that, the spring pushes the cartridge into the feed lips meanwhile the follower doesn’t tilt, hence there won’t be any jamming of the magazine. The removable floorplate is slimmer and stronger meanwhile the pop-up dust cover reduces any form of dust intrusion. In other words, it can be said that the pop-up dust cover aids in the cleaning process. Speaking about cleaning, the disassembly is practically tool-less so you can strip it down with your hand in fact, to undergo cleaning. Apart from that, is fully compatible with these products which are the HK 416, M27 IAR, British SA-80, MR556A1, FN SCAR MK 16/16S and similar other lowers. All in all, the third generation of PMAG further expands the versatility, strength and reliability of the original PMAGs. In fact, it can be said that this 40 round polymer magazine continues to revolutionize magazine technology to accommodate the AR-15 platform. If you’re an avid shooter or think 30 rounds are too little for you, this product or the 60 round model mentioned above would be perfect for you. First things first, this PMAG model brings all the Gen M3 enhancements of the conventional 30 round model to a compact 20 round form factor. So, if you’re a fan of prone shooting, the 20 round mag is perfect for you because you’ll not have too many rounds for example, 30 rounds or too little rounds, such as 5 or 10 rounds, to a point where you have to frequently reload it. Departing from the previous PMAG 20 standard, the Gen M3 is equipped with a curved body configuration, together with the same constant-curve geometry of the 30 round model, for your added convenience. In fact, this configuration not only aids in a more reliable feeding process but also will give you a shorter mag. That being said, a shorter mag might come in handy because it is easier to handle in the prone position. In addition to that, this product is said to be super durable, ultra-dependable and battle hardened by combat experience. Moving on to its compatibility, it is compatible with these rifles/firearms such as the HK416, MR556A1, AR-15/M4/M16, M27 IAR, British SA-80, FN SCAR MK 16/16S and other similar products. Similar to all the previous magazines, it is able to hold the .223 and 5.56 NATO ammunition. Just so you know, the .223 and 5.56 NATO rounds are the main and popular AR-15 ammunition. Equipped with a black finish, this 20 round magazine comes with a solid polymer construction. In other words, it is made from impact as well as crush-resistant molded polymer, therefore contributing to its excellent strength and sturdiness. It is available in a quantity of either 1 or 10. If you’re an avid shooter, you should buy them in bulk because you’ll not only get to save cost, but it will be a great investment in the long run. A magazine is referred to as an ammo storage or feeding device within a firearm. There are two styles of magazines, with the first one being the removable mag and the latter being a fixed mag. Apart from that, it consists of a few parts altogether which are the spring, feed lip, spring follower, body and base. The mag’s follower functions to hold the ammunition in place, so that they are able to load into the barrel breach properly, with maximum ease. The feed lip on the other hand is usually located at the top of the magazine, whereby it prevents the cartridge from falling out of the magazine until it is pushed forward and into the breach, via the bolt. Moving on to the spring, it ensures good pressure on the cartridges, therefore allowing them to rise with enough force to hit the feed lip. Moreover, you need to make sure that the magazine has good tilt and balance. If the follower tilts one way or another, the rifle might get jammed in the midst of feeding. Apart from that, this AR-15 mag comes in all shapes and sizes, depending on the number of round/capacity that it has to accommodate. For instance, some are able to accommodate as low as 10 or 20 or as high as 60 rounds in the magazine chamber. However, the most common capacity is 30 rounds. So, it can be said that the size of the mag increases when the number of rounds increases so it can hold all of the intended rounds securely. There are also 2 distinct feed lip designs which are the single-feed and double-feed magazine design. For single-feed one, the top cartridge touches both lips and is mostly used in single-column box magazines meanwhile for the double-lip type, its wider set of lips results in the second cartridge in line forcing the top one against one lip. That being said, the double-feed design is proven to have good resistance against jamming. Now, let’s look at the difference between the fixed and detachable magazine. The fixed type is also known as an internal, integral box. It is built into the firearm therefore, not easily removable. Often utilized in bolt-action rifles, the integral box is charged through the action, with only one round at a time. Conversely, the detachable box is a basically a self-contained device whereby you can load or unload it to the host firearm. For your information, they are attached using a slot in the lower receiver of the AR-15. Since it’s removable, you can detach it with ease, and replace it with another. One of the plus point of having this type of magazine is that it speeds up the reloading process as well as provides you with quick access to the ammo. Moving on, the common confusion a lot of people have is differentiating a magazine and a clip. So, let me clear your doubts. The rectangular box-like device is the magazine. It holds cartridges for your firearm and slides from the bottom of your rifle. In other words, it holds shells under spring pressure so it is well-prepared for the feeding process, in which the ammunition is fed into the firearm’s chamber. Some of the popular magazines include the tubular, drum, box as well as rotary ones. Meanwhile, the clip comes without a spring. It doesn’t feed the shells directly into the chamber, instead it places the cartridges in the correct order to charge the magazine. For example, the stripper clips ensures that the rounds are stripped into the magazine while the others are usually fed together with the shells into the mag. After all rounds are fired, the clip is ejected/ released from the firearm. In short, the process goes like this; the clip feeds the magazine and the magazine feeds the firearm during shooting. In a nutshell, a magazine is an essential part of the firearm because it stores your cartridge to be fed into the chamber followed by the barrel, in order to fire a shot. Hence why, you should choose the right product which is solid and strong enough to withstand strong impact as well as have an excellent corrosion resistance. A good magazine will result in an accurate and good overall shooting performance. Thus, I hope my review assists you in making the right choice. Happy shooting!